The Longmen Grottoes are located along the banks of the Yishui River 13 kilometers south of Luoyang proper. Carved in ancient China and stretching some 1 kilometer, it is one of the three most famous grottoes in China, together with the Dunhuang Grottoes in Gansu Province, and the Yungang Grottoes in Shanxi Province, and a major national scenic spot. The work began during the reign of Emperor Thihe of the Northern Wei period (535-556) and lasted for 400 years. There are 1,952 grottoes, 750 niches, 40 pagodas, and more than 100, 000 Buddhist statues, big or small. 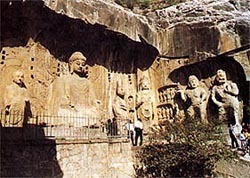 The most well-known caves are Guyang, Binyang, Yaofang, and Wanfo (Ten-Thousand-Buddha). The largest Buddhist statue, 17 meters high, is found in Fengxian Temple.